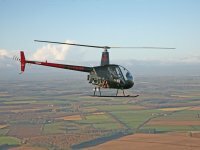 Your opportunity to experience the magic of rotary flight in this 30 minute lesson. Includes pre-flight briefing; chance to take the controls; chance to have a go at hovering and certificate of flight. Friends and family welcome. On arrival you will be introduced to your instructor and offered a cup of tea or cofee. There will be a short pre-flight safety briefing during which your instructor will answer any questions that you may have. You can also discuss where you would like to fly - maybe over your own home or an area you know. Then it is ouit to the aircraft for a look round before taking to the skies. Once airborne you will be invited to take the controls and fly yourself. At the end of the lesson you will return to the airfield and you can have a go at hovering - more of a challenge than you think. Certificate of flight will be presented at the end of the session for you to take home. Friends and family welcome to come along and take photographs and there is a seating/viewing area where they can wait for student.